In February 2009, India's Ministry of New and Renewable Energy (mnre) signed a memorandum of understanding (mou) with the US Department of Energy (doe). The memorandum formalizes "cooperation in the development of biofuels" between the two countries. For the US the focus on biofuels is part of a strategy to de-addict its oiloholic economy. It is estimated the world's most energy guzzling country will require approximately 60 billion gallons of advanced biofuels by 2030. The Obama government signed the biofuel cooperation agreement with India two weeks after it was sworn in. The US-India energy dialogue between Prime Minister Manmohan Singh and former US President George Bush had, in 2005, led to the creation of five working groups--the most talked of being the one on civil nuclear energy. Less heard of is the working group on new technology and renewable energy. The memorandum lists eight areas of cooperation. It seeks the production of feedstock with active involvement of local communities. There are fears of more government programmes like National Rural Employment Guarantee Scheme being diverted to encourage US-designed energy cropping. Also on the anvil is the development of quality planting material--this will open the gates for new proprietary technologies. The memorandum makes mention of sugarcane varieties with high sugar content, sweet sorghum, sugar beet and cassava. DuPont, a US company looking to expand sugarcane plantations in India, is most likely to cash in on this. 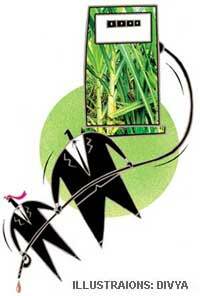 The US transnational Monsanto has plans to develop a genetically modified (GM) variety of sugarcane by 2015. Syngenta AG, a Swiss pesticide and seeds major that has bought up a substantial part of the North American corn and soybean business, is also working with the Vasantdada Sugar Insitute in Pune to develop pest-resistant sugarcane varieties. Syngenta Seeds Inc is already in collaboration with Tamil Nadu Agriculture University to develop Tropical Sugar Beet (tsb) varieties in its bid to popularize them. The US is the top producer of sweet sorghum where it is used mainly as animal feed, while in India it is the poor person's staple. Sweet sorghum is fast being seen as a major ethanol provider. Last year the US Department of Agriculture (usda) and Texas A&M University organized an international conference at the university on sorghum (jowar) as biofuel. At that conference the US signed an agreement with China for cooperation on sorghum biofuels. usda also has the world's largest collection of sorghum germplasm. Because it grows well on "marginal" lands, it is likely to be pushed largescale as the crop to grow on India's wastelands. The Indo-US mou states feedstock is to be made available through non-edible oilseed plantations on wastelands. Villagers and pastoralists have repeatedly pointed to the multiple subsistence-level functions of land wrongly designated as waste. Environmentalists in India and abroad have been urging government agencies not to ignore the ecological role of such land. There is already controversy over the American GM cassava project. The US has been pushing for its field trials in Nigeria. With unresolved biosafety questions and an inadequate regulatory regime India is ill-equipped to deal with a fresh surge of GM crops. Moreover, the mnre does not have the mandate to allow entry of GM crops when the matter is being considered by India's Supreme Court. The mou also talks of encouraging advanced first and second generation biofuel technologies. The impact of all these on small farms and forest-based communities is yet to be assessed. Meanwhile India's national biofuel policy is still under wraps. A right to information application wanted mnre to make public the contents of the mou. But click the Bio Energy News icon on the ministry's website and it still says "under construction". Will the new mnre minister take a hard look at Indian realities, please?